Just as tickets for the 2012 Glyndebourne Festival go on sale to the general public (booking opened at 00.01 on 24 March), we take a look at likely Festival highlights and at developments under way on the Sussex Downs. The season itself starts on 20 May with a new production of The Cunning Little Vixen, directed by Melly Still, whose previous production of Rusalka at Glyndebourne proved to be a highlight of the 2011 season. Indeed, the 2011 season in itself proved to be a highlight in Glyndebourne’s long history, achieving an astonishing 99.4% of capacity in box office sales – the highest figure recorded since the new house opened in 1994. 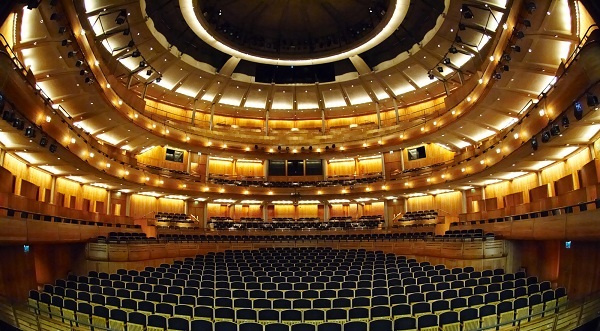 Whether or not the 2012 season will match this remains to be seen – what is certain however is that Glyndebourne is at a particularly vibrant phase of its long period of development, and that the 2012 Festival will offer some undoubted operatic highlights to set the bar against which other summer opera festivals will be judged. We caught up with David Pickard, General Director at Glyndebourne, to ask for his take on the forthcoming season. He sees it as a season of old favourites, with something for everyone, although he is the first to admit that Glyndebourne is breaking the old show business rule of never working with children and animals – Vixen and Ravel’s L’Enfant et les Sortileges being in the risky category here! But Pickard, as he well might, exudes confidence that the season as planned – three new productions, three revivals – will play to all the values that make the Glyndebourne stage such an exciting place to be. "In recent years there has been a slight bias towards expanding the repertoire, doing operas at Glyndebourne that had never previously been seen here (one has only to think of the Tristan und Isolde and of last year’s Die Meistersinger to see the truth of that) but this season we shall be doing what I think Glyndebourne does best, with new productions and new young casts in operas that have established themselves here in the past". Mind you, although Le Nozze di Figaro has a Glyndebourne pedigree that goes right back to the opening night of the very first season, and has never been long absent from the Festival schedule, the Vixen has been a comparative rarity: it is only the more elderly Glyndebourne members who will recall a young Simon Rattle conducting it in the Jonathan Miller production of 1975! Musically it will be in good hands once again – outgoing Music Director Vladimir Jurowski decided it was the one production he really wanted to conduct, and I can hear already the vibrant timbre and the sophisticated sheen that he will bring to this haunting score. And Melly Still made many friends at Glyndebourne with her take on Dvorak: the season ought therefore to get off to a flying start. Pickard for one is clearly excited by the ideas she is bringing to the piece, and by her style of working at Glyndebourne. La Cenerentola follows, a revival of the 2005 production by Sir Peter Hall. I saw it then on its opening night (a young Anna Netrebko was sitting in the stalls, soaking up the Glyndebourne experience!) and I thought it much better than the contemporary critics found it – it had light, air and space and, under Jurowski’s baton, great humour. James Gaffigan is the new conductor and his Alidoro is the Chinese baritone Shenyang, who made a great impression when winning Cardiff Singer of the Year in 2007. Bringing a touch of glamour to the Cinderella role will be American mezzo Elizabeth DeShong. With well over 100 performances since Cenerentola was first performed at Glyndebourne in 1952, the opera fits Pickard’s description of an "old favourite". The third production of the new season could be described as a perennial favourite, not only at Glyndebourne but in every opera house and every country round the world – Puccini’s La Boheme. The production by David McVicar won critical plaudits when it first aired with Glyndebourne on Tour in 2000 (it toured again most recently as last year) and the updating steers a skilful course between the grounded realism of the characters in their original Parisian setting and the more contemporary (and equally exotic) London-inspired (Soho to be precise) décor that McVicar brings to the stage. There are not one but two Cardiff prize-winning singers in this year’s cast, and Kirill Karabits should give an exciting account of himself in the pit. My only slight reservation (and I can say this safely, since La Boheme – as Pickard confirmed to me – is one of the two productions that will absolutely sell out this season) is that I find sitting through Boheme in mid-summer slightly counter-intuitive. Palais Garnier, or nowadays the Bastille Opera is where I love to see these scenes of Bohemian life, and preferably in the run-up to Christmas. But Glyndebourne undoubtedly has another banker in its hands. As they have with the second new production of the season, Le Nozze di Figaro, which premieres on 27 June (I have my ticket already). I ask Pickard – is there something symbolic about entrusting this hardy perennial this year to the Festival’s Music Director-designate, Robin Ticciati? Pickard laughs – and reminds me that Ticciati was scheduled to conduct Figaro this season long before being chosen to succeed Jurowski – but then agrees that it is indeed a happy coincidence that a young conductor, of whom Glyndebourne have high hopes, should be tackling a new production, by Michael Grandage, of the single Mozart opera that perhaps has more resonance at Glyndebourne than any other. Grandage of course directed the superlative Billy Budd at Glyndebourne in 2010, and great things are expected both of him and of an exciting looking cast. Musical Criticism will aim to post its review before all the others! The third and last revival of the season is Purcell’s The Fairy Queen, staged (when it premiered in 2009) with huge visual imagination and dramatic impact in a production by Jonathan Kent. Whilst loving the constituent parts when I saw the production in 2009, I had my doubts about its coherent impact as a piece of music theatre: there is so much to take in, both of the Shakespeare (and cod Shakespeare) that makes up the text, and of the richly contrasted musical interludes that punctuate the succession of scenes, that in the end I found myself thinking along the lines of the ‘less is more’ principle. But Laurence Cummings will conduct stylishly and I have to say I find myself tempted by the thought of a return visit… There are moments of sheer Purcellian bliss in the work (which Carolyn Sampson will exploit notably) and the staging is a tour de force. The Fairy Queen opens on 20 July. Last, and by no means least, the Festival will stage what Pickard describes as "the perfect construct for Glyndebourne – the double bill". It is not hard to see what he means – the long dinner interval at Glyndebourne, whether picknicking on the lawns, by the lake or ensconced in the comfort of any of the three restaurants, is the perfect break between two one act operas. In this case they are Ravel’s L’Heure Espagnole and L’Enfant et les Sortileges, directed by Laurent Pelly and conducted by Kazushi Ono, the team that made such an impression with Hansel and Gretel in 2008. In what looks like some exciting casting, I would single out the young French mezzo Stephanie d’Oustrac as a performer to watch, and after their account of the Humperdinck score together (a highlight for me of the 2008 Festival), the LPO under Ono as the orchestral/conductor combination to savour for sheer quality of sound. The works themselves are a huge contrast (and Glyndebourne has made a bold choice in selecting the double bill performance on 13 August as its ‘family ticket’ day, when children can sit in the best seats for £30) but I for one cannot wait to experience them. Opera history might have been a little different if Franc-Nohain, author of the Heure Espagnole libretto, had succeeded with his first choice of composer to set the work: he offered it to Claude Terrasse, the joyful belle époque operetta composer who was widely known as the "Offenbach of our time" in the early 1900s. But Terrasse, perhaps wisely, passed on the offer and suggested his friend Maurice instead. Thus was born, in 1911, the twenty-one short scenes that describe how time is kept in Spain. To see the work alongside L’Enfant et les Sortileges will be a delight. How will the general public fare in their attempts to book Glyndebourne seats? Pickard is clear: "When general booking starts, 20% of the house’s capacity is available. There are of course fewer seats unsold after members have made their bookings for Figaro and for Boheme, but there is plenty of capacity". Any tips for people wanting to experience Glyndebourne for the first time? "Come a little later in the season – there is always greater availability in August and we sometimes enjoy some of the loveliest evenings of the season then". There is also of course the relatively recent Glyndebourne initiative of screening live performances into the cinema, an achievement of which Pickard is proud. This year all three new productions will be screened live into the Picturehouse cinema chain, starting with Vixen on 10 June, continuing with Figaro on 17 August and finishing with the Ravel double bill on 19 August. These truly live screenings will be interspersed with screenings of a live performance of Cenerentola from the 2005 season and one of The Fairy Queen from the 2009 season – a great way to see what Glyndebourne is all about and to pave the way for future visits to the Sussex Downs. If you add the specially priced under 30 performances, and the family tickets initiative, it is clear that Pickard and his team are big on outreach and confident that they are doing the right thing to place Glyndebourne on a broader map. And talking of the map, I cannot resist asking Pickard about the other recent initiative that most visitors to the house will notice for the first time this summer: the wind turbine that is designed to make Glyndebourne almost self-sufficient in energy terms. "Of course, it’s far too early to say – we need a full year’s data before we can prognosticate with confidence – but I can tell you that in December we produced more than twice the amount of power that we consumed! So the early signs are good". Let us hope that for this extraordinarily English institution, fair winds continue to blow. More information is available at http://glyndebourne.com/.